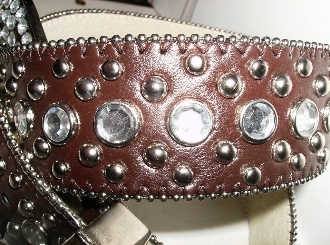 BROWN LEATHER WESTERN BELT WITH CRYSTAL AND STUDS. * Silver metal rhinestone belt tip. MATCHING PURSES ALSO AVAILABLE - SOLD SEPARATE. CLICK ON PHOTO TO SEE DETAILED VIEW.